Reference number for this case: 24-Apr-54-Mortagne-par-Bruyères. Thank you for including this reference number in any correspondence with me regarding this case. This letter, sent by Roger M... of Mortagne les Bruyères (the Vosges), reports a fact which goes back to 1954. But it is only in 1974, after Mr. M... saw again twice a similar phenomenon, that he understood that 21 years before, he had been the witness of a ufologic display. April 24, 1954, 3 o'clock in the afternoon. "I first heard a great noise. You would have said it was a train passing on a metal bridge or the bursting of a bomb of strong caliber. I threw myself instinctively behind a large rock, while looking up in the air." "And I saw three enormous machines, without wings, pass above me. Astonishing thing: their slowliness and their mass. At the time, I believed that they were enormous airships. But, shortly, the two first had advanced without making any noise. The 3rd stayed behind, did not move any more and appeared to go down slowly, without making noise either." Curiosity pushed me to await the continuation. The machine had been posed at approximately 50 meters from me and at 40 centimetres of the ground. It thus did not touch ground and was approximately 300 meters long. Of that I am certain because, after its departure, half an hour later, I measured the ground (at the time, I was a logger), delimited at each end by a small fir tree at an end and by a birch at the other end. As for its width, it reached 60 meters. I approached the machine, I walked around itit. It was round and, referring to 39 meters a beech which was cut down 8 days later, I estimated that the apparatus was about 60 meters high. Then, I posed my hand on it. It was cold and hard. I tapped it initially with my fist, then with the back of my axe, then with the edge. The sound was deaf, like full. At this time, I moved back, slowly, to my rock on which I leaned, and I started to be afraid. I wanted to resume my work, I could not. Impossible to move, I remained stuck to the rock. The machine then rose slowly in the air and it is only when it disappeared that I was able to move again. It happened to me 21 years ago and, until now, I had never talked about it. I suspected well that I had not seen an airship for the airships are never made of steel or iron. Moreover, the machine had neither doors nor port-holes... What I had seen (I understood only much later, thanks to a book that one had lent to me and also to Nostra) what I had seen - and touched - it was a A.F.O. I am all the more certain since I again saw "something" first in 1973, then in 1974, in the Moselle and in Mortagne in the Vosges. The machine (1973) completely ruined my compass. Credit: the articles in Nostra magazine in 1975 were scanned and shared on the web by ufologist Patrice Seray in 2011. The two authors indicate that on April 24, 1954 at 15:00 p.m. in Mortagne-par-Bruyères, according to his letter to Nostra magazine, the witness, Mr. Roger M., logger, was chopping wood when he heard a loud noise. He see three wingless UFOs passing slowly above him, of an enormous volume, giving him the feeling of an enormous mass. One of the three machines goes down and arrives at 40 centimeters above the ground without touching the ground, within 50 meters of the logger. The logger approaches, walks around it, evaluates its dimensions as of sixty meters in height and three hundred meters in length. He touches the surface of the object, which appears cold and hard to him. He hits it with the hand, then with the handle of his axe, then with the blade of his axe. He then moves back to a rock on which he leans, and he then feels paralyzed, stuck to the rock. He witnesses the departure of the machine and when the machine disappeared he "retrieved his capacities." The catalogue indicates that in Mortagne Par Bruyère, Saturday, April 24, 1954 at 3 p.m., local time, Roger Mr., logger, deceased since, was the witness of an observation whose source is "OVNI, le premier dossier complet des rencontres rapprochées en France" by Michel Figuet and Jean-Louis Ruchon, page 69, citing NOSTRA. A round object, that the witness says was an apparatus, 60 meters height and a 300 meters length was within 40 centimeters of the ground and about 50 meters of the witness. Before observing this object, the witness had seen three enormous and wingless UFOs passing, with a great noise like a train passing on a metal bridge, or the explosion of a bomb of strong caliber, expression which astonishes the author of the catalogue. The witness was cutting wood when he heard a great noise and saw three UFOs passing above him, whose slowness and volume gave the impression of an enormous mass. The witness saw the descent of one of the three objects which landed at about fifty meters of him without touching the ground. He approached this apparatus, walked around it, then put his hand on its "cold and hard" hull, hit it with his fist then with the back of his axe then with the edge of the axe. At that moment, he walked back slowly to a rock on which he leaned. He felt paralysed, "stuck to the rock" and witnessed the departure of the machine which rose slowly. When it disappeared, the witness recovered his faculties. The author of the catalogue notes that there are "effects", and that it is one of the rare cases where the witness touches a UFO, and also notes that the witness reported his observation writing to the NOSTRA magazine. He notes that an investigation "was made at the time by Joel Mesnard", of which "we did not obtain" the manuscript yet but that they met recently and Mesnard specified to them that he believed in the sincerity of the testimony. Joel Mesnard details the case presented on page 44 of issue 261-262 in the catalogue of the Vosgean cases by François Diollez, under the localization "Mortagne-par-Bruyères". He explains that he managed to find the only surviving witness, Roger Mougeolle, whose health was then critical, because shortly after having been a lumberjack, he worked in an unprotected environment handling glass fiber, which dangers was not realized at that time. He was thus almost permanently confined to bed in a private clinic of Bruyère in 1976, breathing with difficulty at an oxygen bottle. The sighting took place on the territory of the commune of Bois-de-Champ at eight kilometers in straight line in the North-East of the town of Bruyère, in the department of the Vosges. He and the other witness were on a vast hill timbered with steep slopes at some places, and 585 meters above sea level in the south of the locality "La Grande Cheminée", close to the village of Eaux-Rouges. Joel Mesnard gives some historical background of this hill. At the end of April 1954, in the afternoon, Roger Mougeolle, then aged 37, was working at the top of this hill helped by Gilbert Doridant, aged 19, a simple-minded which did this work for the very first time and which had much difficulties in learn how to read a watch as Roger Mougeolle tried to teach him, and which was to die 2 years later in a dreadful way, crushed by a loading of tree trunks whose fasteners had broken; which is why he never had an opportunity to testify to the observation. At this time Gilbert Doridant burned waste branches while Roger Mougeolle pruned trunks of cut down fir trees. They then heard a loud noise coming from the sky, comparable to a train driving on a metallic bridge. Silence fell down at once and three objects of very big size appeared above the hill. Their shape was roughly a lengthened ellipsoid or an immense cigar. Two of the objects immediately moved away without noise, while the third came down gently towards the clearing where the two loggers worked. No protuberance or structural details were seen on its surface, expected for an assembly of small black and white spots, which made little by little place to a uniform gray color, of metallic aspect. The dimensions were gigantic, with a length of possibly more than two hundred meters, a width and a height about perhaps eighty or one hundred meters, Roger Mougeolle having had the impression that the thing was broader than it was high. The object was immobilized just above ground-level, its lower part being at a few tens of centimeters above the grasses of the clearing. It was then rigorously motionless and completely silent. Roger Mougeolle was not frightened because he was believing that it was an airship. Gilbert Doridant was terrorized and had immediately ran away, he would refuse to go up in the forest thereafter. Roger Mougeolle approached the surface of the immense object that filled all his field of vision, he raised the hand and touched it. The surface was smooth, cold and hard like steel and it is thus probably at this time that he thought that it was not an airship. He took his axe and then struck the object with the side of the blade, "to check." The shock of the blade on the surface had produced a sound similar to that of striking a large steel part. At the time when the tool hit against the surface, Mougeolle was thrown back at five or six meters, finding himself immobilized at the foot of a rock and incapable of moving. The way in which he was brutally thrown back was not due to an air blast, but to a force of unknown nature, apparently distributed uniformly on all his body. He had the very clear impression now that the mere presence of the object deprived him of his freedom of movements, and that it was not fear which paralyzed him. At the end of a few moments, the object started to rise, moved away and disappeared, and the paralysis ceased at once. The author indicates that in the Spring of 1954 towards the end of April one afternoon, a very large ship was observed in a place close to Bruyère in the department of the Vosges in the North-East of France, at the locality Bois-deChamp, a practically deserted place. 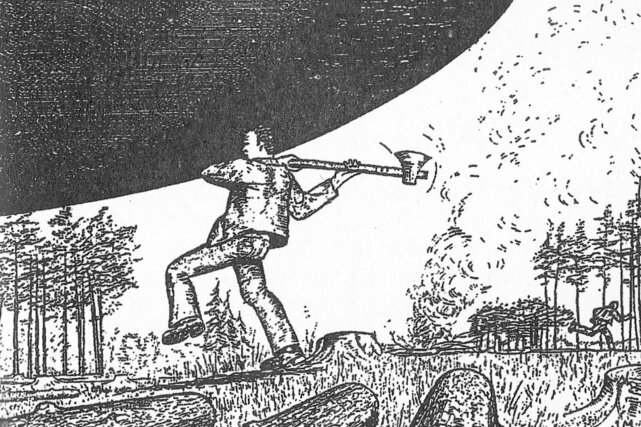 Roger Mougeolle and Gilbert Doridant cut wood when they suddenly heard a great noise, like a train passing on a metal bridge, a sound characteristic of UFOs, which was often described in the same terms. "Its surface was completely smooth, of a gray metal. Mougeolle estimated that it measured more than 200 meters in length by approximately 80 to 100 meters broad and as much in height. The monster was immobilized at a few decimetres of the ground." Terrified, Doridant fled and never returned in this part of the forest. Mougeolle, convinced that it was a conventional plane, advanced and passed the hand on the fuselage, which he found to be cold and smooth like metal. He then hit the ship with his axe to see what could happen, and the hit produced a deaf noise; at once Mougeolle was thrown at a distance of 5 or 6 meters. He found himself laying without being able to do any move, according to Mesnard. What projected him was thus undoubtedly not an air blast nor anything like it, but something completely unknown, an absolute force which would have acted on the whole of his body. At this point in time he understood that what nailed him on the ground was nothing else than the monster itself. The huge ship kept its position during several minutes, blocking Mougeolle's view, then took off and disappeared. Fortunately, the witness suffered no after-effect. The author indicates that in Bruyeres in April 1954, Roger Mougeolle, aged 37, was logging in the forest at Bois-de-Champ, were logging off branches with another man, when they heard a loud noise, like a train going across a metal bridge. It became silent again, and they then saw three cigar-shaped objects coming towards them. Two of them passed silently over, but the third came down to the clearing where they stood. It had a smooth, grey, metallic surface, with no markings or protrusions, and was over 600 feet long. It stopped and hovered just above the ground. The other man fled, but Mougeolle walked up to the object and hit it with his axe. It made a dull sound when the axe struck it, and Mougeolle was thrown back 20 feet. He lay on the ground totally paralyzed for several minutes. The object left, and when it did, he was able to move again. Roger Mougeolle, aged 37, was logging in the forest at Bois-de-Champ. He and another man were lopping off branches when they heard a loud noise, like a train going across a metal bridge. It became quiet again, and then they saw three cigar-shaped objects coming towards them. Two of them passed silently over, but the third came down to the clearing where they stood. It had a smooth, grey, metallic surface, with no markings or protrusions, and was over 600 feet long. It stopped and hovered just above the ground. The other man fled, but Mougeolle walked up to the object and hit it with his axe. It made a dull sound when the axe struck it, and Mougeolle was thrown back 20 feet. He lay on the ground totally paralyzed for several minutes. The object left, and when it did, he was able to move again. At the end of April, afternoon: In Bois-du-Champ (the Vosges), Roger Rougeolle [sic] and Gilbert Doridant [sic] see a gigantic UFO in the shape of airship, motionless at a few centimeters of the ground. Its hull seems to be made out of steel and to make sure of this, Rougeolle approaches at the nearest and tries to give it a hit with the side of his axe's blade. He found himself thrown at a few meters behind by a force applied uniformly on his body. The witness estimates to have felt an effect of paralysis which immobilized him until the departure of the object (LDLN N° 275-276, p. 27). Luc Chastan indicates that in the Vosges in "Mortagne les bruyères" on April 24, 1954 at 15:00 hours, "That day, around 15 hours, the logger Roger Rougeolle, 37-year-old, cuts wood at Bois-de-Champ, in company of Gilbert Doridant, when they hear a great noise. He sees three UFO passing above them. Their slowness and their volume giving the impression of an enormous mass. Two of the objects fly over them while the third starts a descent, with a noise comparable with that of a train travelling on a metal bridge. The UFO lands at 50 m, not touching the ground (remains at 40 cm). It is enormous. Rougeolle approaches and walks around it. He puts his hand on a cold and hard hull, hits hit with the fist then with the back of the axe, then with the edge. At this time he moves back slowly to a rock on which he leans: he feels paralysed, stuck to the rock and attends the departure of the machine which rises slowly." The sources are noted as "Ovni, Premier dossier complet... by Figuet M./ Ruchon J.L. ** Alain Lefeuvre pub. 1979"; "Mini catalogue chronologique des observations OVNI by Van Overmeire Godelieve ** http://users.skynet.be/sky84985/" and "RR0 ** http://www.rr0.org". The two authors indicate that in the end of April 1954, Roger Mougeolles and Gilbert Doridan, two loggers of the Vosges, were working to cut wood at the location Bois-deschamps in the middle of the Vosgean forest close to Bruyère when they were heard like the noise of a train passing on a metal bridge, a very incongruous crashing sound for this deserted place. In the silence which followed both men saw three large objects in the shape of cigars. The two first passed silently above their heads, the third came down in the clearing where they worked. The authors quote "itss surface was completely smooth" and " Mougeolles estimated that its length was of more than 200 meters by approximately 80 to 100 meters broad and as much in height. The monster was immobilized at a few decimetres of the ground." The authors say that Gilbert Doridan chose to obey by anticipation the famous advice by Jimmy Guieu "if you see a UFO, scram", and always refused to go back to this part of the forest, whereas Mougeolles, convinced that it was a plane, approached and passed the hand on the fuselage, which was cold and smooth like metal. By curiosity he hit it with an axe, there was a deaf noise at the time of the impact and he found himself thrown 5 or 6 meters from there. He certified that it was not an air blast which had propelled him but a force that acted on all his body. The authors quote "Mougeolles found himself laying without being able to do any move... At this point in time he understood that what nailed it on the ground was none other than the monster." The huge ship blocked his sight by maintaining its position during several minutes, then took off and disappeared. The witness luckily suffered no after-effects. The authors conclude that it is not wise to rub with the UFOs. The source is indicated as "Joël Mesnard, cited by T. Good". Sketch published in [ld1] and [tg1] and said to show Roger Mougeolle attacking the ship with the axe, while his companion runs away. [no1] "J'ai touché un O.V.N.I...", anonymous article in the sensation magazine Nostradamus ("Nostra"), France, #192, December 10, 1975. [fr1] "OVNI, Premier Dossier Complet des Rencontres Rapprochées en France", book by Michel Figuet and Jean Louis Ruchon, Alain Lefeuvre publisher, France, page 69, 1979. [fd1] "Catalogue Rétroactif 1954 des Cas Vosgiens (1)", article by François Diolez, in the ufology magazine Lumières Dans La Nuit (LDLN), France, #261-262, pp 44-45, March/April 1986. 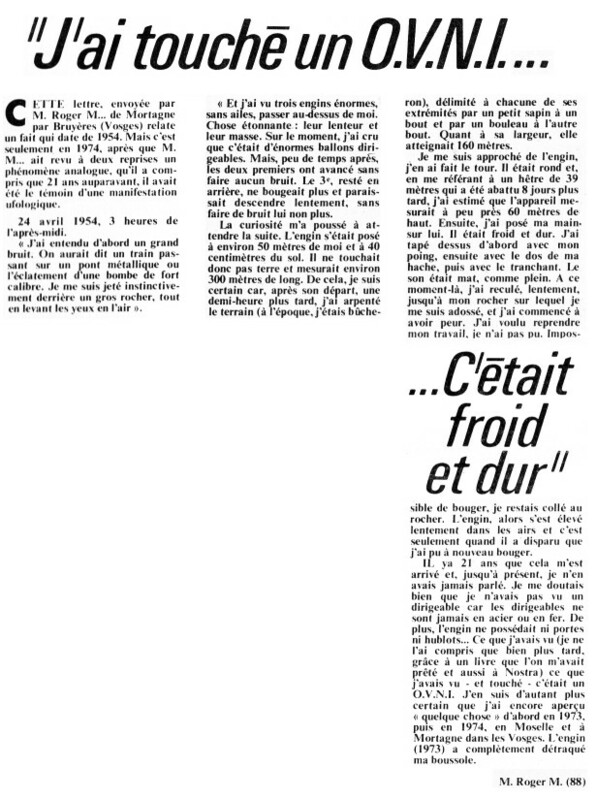 [jm1] "Un Dirigeable en Acier: l'Affaire de Bois-de-Champ (Vosges) en Avril 1954", article by Joel Mesnard in the ufology magazine Lumières dans la Nuit (LDLN), France, #275-276, page 27, May-June 1987. [tg2] "Above Top Secret: The Worldwide U.F.O. Cover-Up", book by Timothy Good, Quill publishers, U-K., page 189, 1989. [---] "Modern Mysteries of the World", book by Janet and Colin Bord, Guild Publishing, page 60, 1989. [tg1] "Alien Base", book by Timothy Good, Century publishers, U-K., 1998. [tg1] "Contacts Extraterrestres", book by Timothy Good, French version of "Alien Base", Presse du Châtelet publishers, France, pp 146-148, 1999. [ki1] "Ce Qu'ils Ont Vu à l'Intérieur des Soucoupes Volantes", book by Daniel and Fabrice Kircher, Le Temps Présent publisher, France, pp 91-92, 2008. 0.1 Patrick Gross January 27, 2007 First published. 1.0 Patrick Gross February 25, 2010 Conversion from HTML to XHTML Strict. First formal version. Additions [tg1], [lc1], [ki1]. 1.1 Patrick Gross October 20, 2011 Addition [no1]. 1.2 Patrick Gross January 26, 2017 Addition [ac1].